Fact: I really like to binge watch a TV series, and create the next season in my head before watching it. 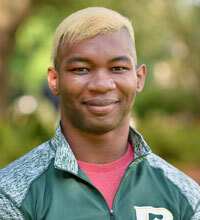 I chose to come to Belhaven because...I wanted to be somewhere diverse, but close to home. Belhaven fit that description perfectly. I knew I wanted to challenge my artistic mind, and Belhaven is definitely an art-oriented university. One relationship that has meant a lot to me while at Belhaven is...the relationship between student and advisor. This relationship with your advisor is one of the most significant bonds you will make here. Your advisor serves not only as your academic course planner, but a resource that can be used after you graduate and begin your career. Because of my degree from Belhaven University...I will be prepared to work in any and all things film, television and digital media related. The film program is so versatile in the career route you can take, which is great for me as I'm the type of individual who doesn't like to limit himself.